Two of everyone’s favorite actors, Glenn Close and John Malkovich, are finally making a new movie together. (They were memorably at odds as schemers and delicious ex lovers in “Dangerous Liaisons” years ago.) “Wilde Wedding,” I’m told, is a wedding comedy written and directed by Damian Harris. He’s the older brother of actors Jared (“Man from UNCLE,” “Mad Men”) and Jamie Harris. Their father was the late great Richard Harris, the fine actor and hit singer (“MacArthur Park”). Glenn plays a huge star, “Sunset Boulevard” like screen legend getting married again on her Long Island estate. Malkovich is one of her exes. That’s all I know so far. Andy Karsch and Robin O’Hara are producing. Fingers crossed for everyone. 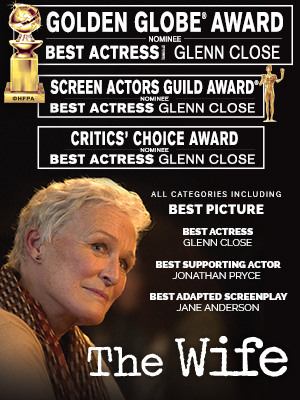 Glenn Close deserves an Oscar. Maybe this will be the one! Gladys Knight Reunites with Stevie Wonder, Dionne Warwick for Apollo Theater Rendition of "That's What Friends Are For"